PRIME MINISTER Rajoy boarded the inaugural Castellon to Madrid high speed train service only to find it 30 minutes late in arriving at the capital. 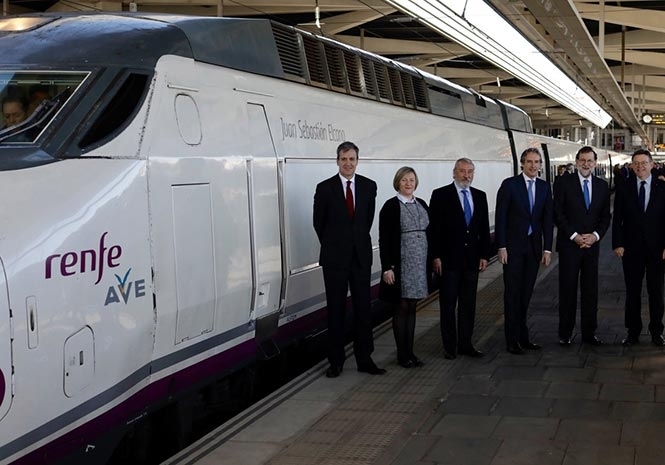 The trip was organised as a public relations event with Mr Rajoy – accompanied by Public Works Minister, Iñigo de la Serna and a number of journalists – left somewhat embarrassed by the fact that the high speed service wasn’t so fast. Whilst it was supposed to reduce the journey time by 30 minutes, it transpires that the train can’t actually travel at more than 100 kmh on the stretch between Valencia and Castellon as it has to share the track with local trains. There is some disagreement between reports from those on board the train as to the reason for the late arrival in Madrid but with a huge ongoing investment in the expansion of the high speed rail service, Mr Rajoy may have regretted the decision to invite the press to accompany him on this journey.